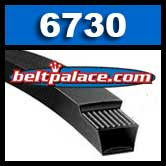 6730 POWERATED BELT. 3/8" W x 30 inches L. Premium Gates brand FHP Aramid/Kevlar V-Belt. 3L300K FHP V-Belt. Consumer Brand, Aramid/Kevlar FHP construction. 3/8" W x 30" Overall Length.